Red Lentil Potato Soup is hearty and filling. 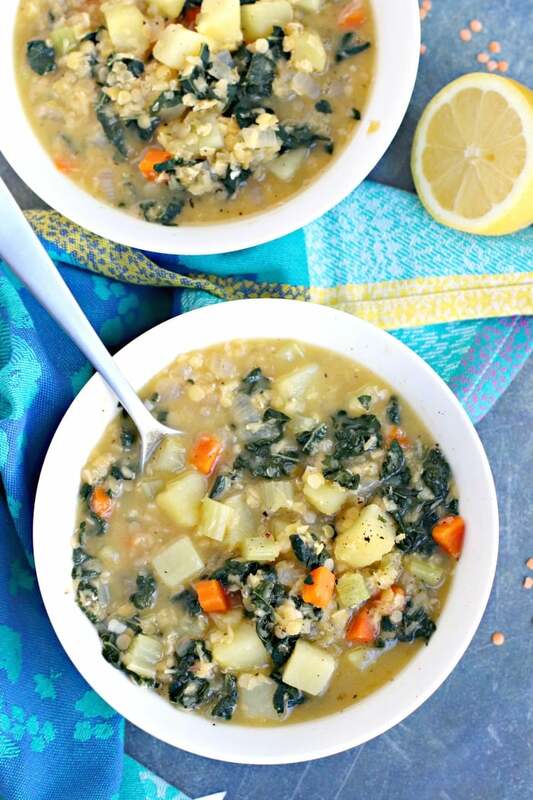 It’s easy to make this vegan soup with basic ingredients in about 45 minutes. One thing I love about cooking with dried lentils is that you don’t need to soak them first. And they cook really fast, especially compared with dried beans. While I often use brown or green lentils in dishes like Roasted Butternut Squash Spinach Salad and Lentil Meatloaf Muffins, quick cooking red lentils are the star of this warming Lentil Potato Soup. They cook in minutes right alongside the vegetables in this recipe, so there’s no need to cook them before adding them to the soup. It’s hearty and high in protein and fiber making it a healthy one-pot meal. Lentil Potato Soup is easy to make in under an hour. I like to use red lentils because they have a slightly sweet yet mild flavor that compliments most vegetables. And they are so soft, they almost disappear into the soup, leaving it with a comforting texture, almost like a stew. You can read more about the most common types of lentils (red, green, brown, yellow, and black) and how to use them in this article from Cooking Light. Like a lot of soups, this one starts off with sauteed onion, garlic, carrots, and celery. Then once those vegetables are soft, in goes the vegetable broth and peeled and diced potatoes. I like to use gold potatoes, but you can also make this soup with Russet, red, white, or even sweet potatoes. They all go well with the flavors and ingredients in this recipe. Sweet potatoes cook a little faster than regular potatoes, so be sure to test them with a fork to know when the soup is ready. After the potatoes have simmered about 5 minutes, the red lentils and kale are added to the soup. And in 10 to 15 minutes, it will be time to eat! While I like to use kale in Red Lentil Potato Soup, other greens can be substituted such as Swiss chard, collard greens, or even spinach. Be sure to keep in mind that collards will take longer to cook while spinach will take only a minute or two and should be added in at the very end. 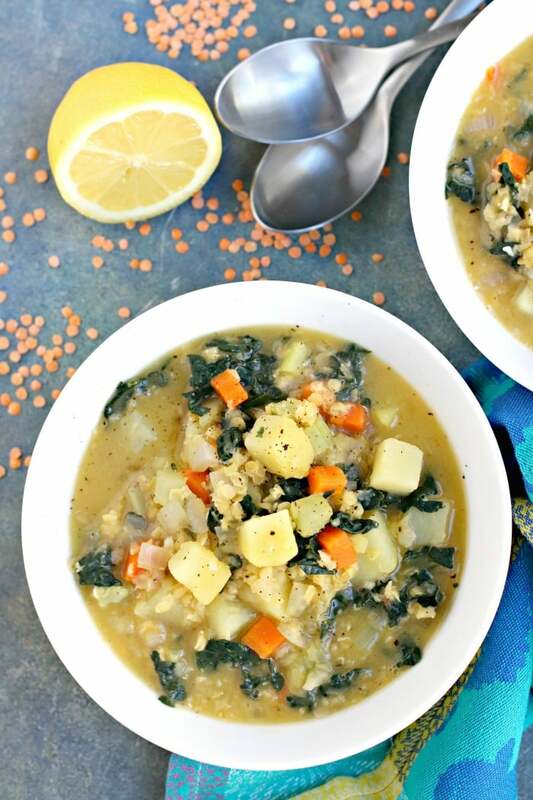 Lentil Potato Soup gets a flavor boost from fresh lemon. Before serving the soup, I taste it and add salt and pepper, as necessary. Then my favorite thing to do is to squeeze the juice of half a lemon into the pot and give it a quick stir. 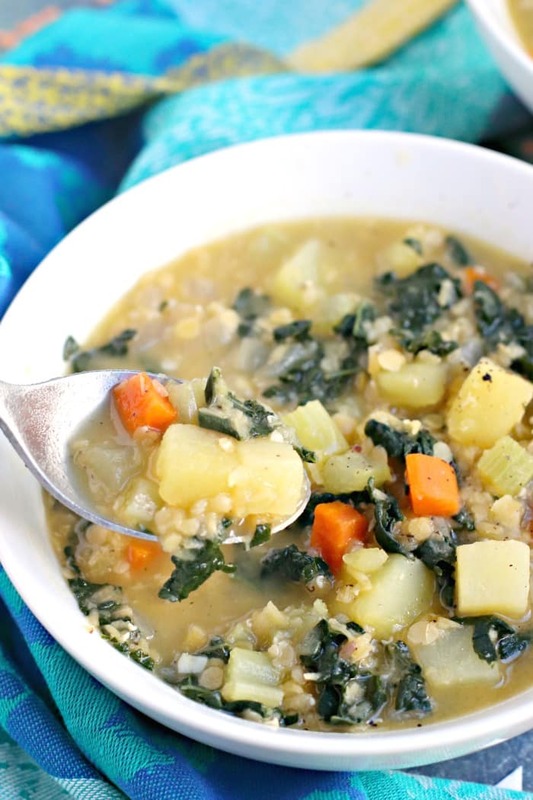 The acid from the lemon really brings out the flavor of the lentils, potatoes, and greens. If you have leftovers or make this recipe in advance, I recommend adding a little more lemon juice before serving to freshen it up. This soup can be refrigerated for up to 3 days or frozen for up to 6 months. 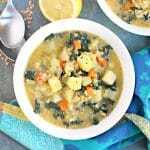 And if you’re looking for more healthy soups, check out the recipes for Vegetable Bean Soup, Instant Pot Lentil Soup, and Vegan Minestrone Soup. Now let’s make Red Lentil Potato Soup! Red Lentil Potato Soup is hearty and filling. It's easy to make this vegan soup with basic ingredients in about 45 minutes. Saute the onion until soft and slightly translucent. Add the garlic and saute 30 seconds longer. Next add the carrots and celery and saute for about 2 minutes more until softened. Add the vegetable broth and potatoes to the pot. Bring to a low boil and simmer for about 5 minutes until the potatoes are starting to get tender but are not all the way cooked when pierced with a fork. Stir in the red lentils and kale. Cook for 10-15 minutes until the lentils and kale are tender and the potatoes are cooked through. Taste and add salt and pepper as needed. Stir in the lemon juice and serve. 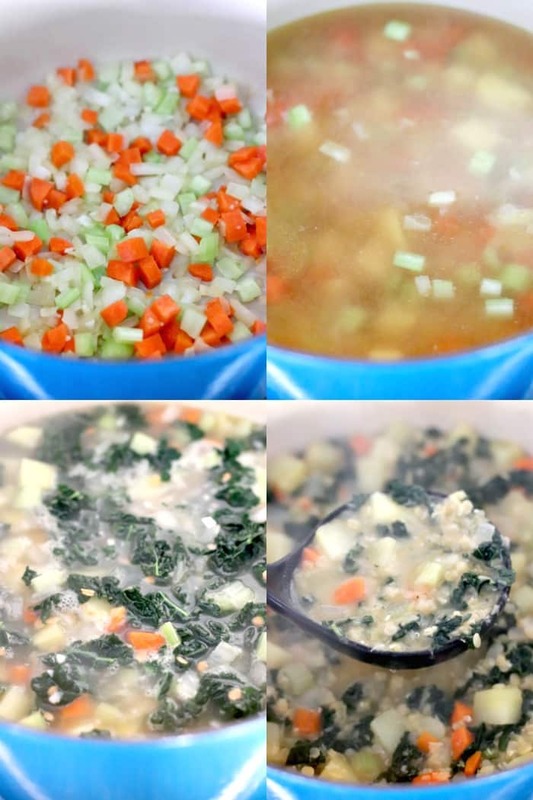 Leftover soup can be refrigerated for up to 3 days or frozen for up to 6 months. Add some extra water or vegetable broth when reheating if the soup has gotten too thick.